You would never believe what I did last weekend, well, I wouldn't. I did trapeze! It's not because that I know I would get sores in all of my body parts like what I have now, but because it's trapeze! I'm not the most adventurous person, although I won't say that I'm boring either, but I do like to try new things within a reasonable limit :P. Even though it is not a life-threatening experience like sky-diving, but still, everyone's scared of heights, and add some swinging to that while you're holding your body with your hands on a bar. No, I don't regret it at all, it's a different experience, yeah... and maybe unenjoyable too, but I'm proud of myself to be able to have the courage to do it. Although it was really hard and scary climbing what seemed to be a never-ending ladder, I did find myself enjoying it at the end and I was even thinking that I could probably do another swing or two. It is a great experience, and a cold one too. I wish the weather was a little warmer as it was super cold that day in Sonoma, California. It hasn't been sunny at all around here. Cloud, rain, wind, coldness are what we have been seeing for the past few weeks, very unusual for California I would say. My feet were freezing cold and it didn't help when I climbed the ladder too as I couldn't feel my toes anymore. Now, let's talk about dessert. 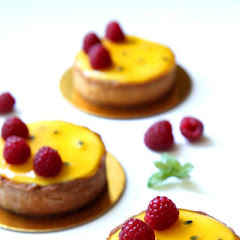 In the midst of the cloudy weather and rain, I feel like a little sunshine in a dessert won't hurt. 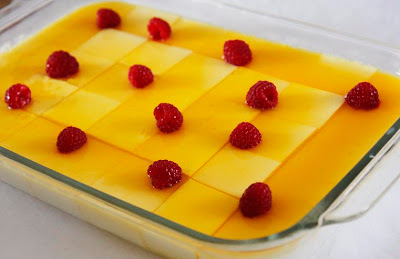 Besides, I promised you already that I would post the recipe for the silk pudding I made a few weeks back. I made this dessert for a potluck gathering for another family member. Every year, they have a potluck celebrating the Chinese New Year and have a fellowship together and every year too, I make a dessert for her to bring to the gathering and this year is no exception too. I knew that I would make this pudding again ever since I made it the first time at San San's farewell. 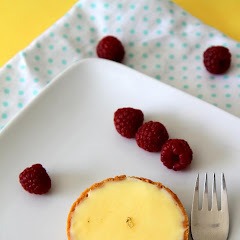 It is so easy to make, simple, tastes wonderfully light and soft and I knew that they're gonna like it. For the syrup, you can actually use different flavor, but it just happen that all Asian grocery stores that I visit, only carry this one flavor. Not that I'm complaining as I love passion fruit flavor, but it's better if I have more options. Mango would be good if it's available. You need to use syrup that's not very thick or sweet, this one I'm using is pretty thin in consistency and this is good since you would use the syrup as the sauce for the pudding. 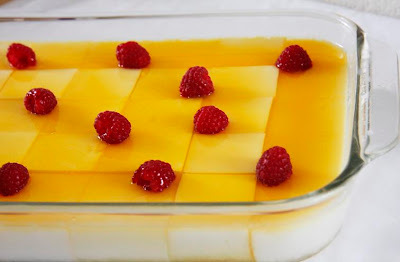 The texture of this pudding is similar of not the same as the almond pudding you would find at Chinese dim sum places, but better (note that I don't like almond flavoring in all kinds of dessert :D). No need to use your teeth to chew as it would just melt in your mouth. Yes, it is soft like that. 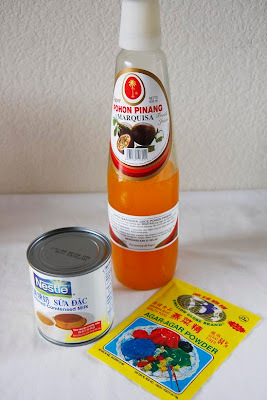 The ingredients are very simple, but they might not be familiar for non-asian. Mix the water, condensed milk and agar2 in a saucepan and bring to a boil over a medium heat. This will take a while, stir often as to prevent the milk mixture to be separated. When it comes to a gentle boil, remove from the heat and pour in a mould. I use 9x13" pyrex glass mould and it fits perfectly. Let the pudding sit at room temperature until at least the steam has gone. Transfer it to the refrigerator and chill until set, about 3 hours at least. 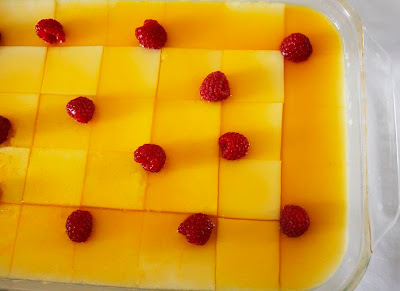 Cut into squares using knife, or if you're using small/mini mould, no need to cut them. Pour enough syrup to cover the surface of the pudding. Shake the pan gently to let the syrup to go down in between the cuts. Add more syrup as needed, but don't go overboard as it will be too sweet. Put the pudding back in the fridge and chill for at least another four hours to let the syrup penetrates the pudding. 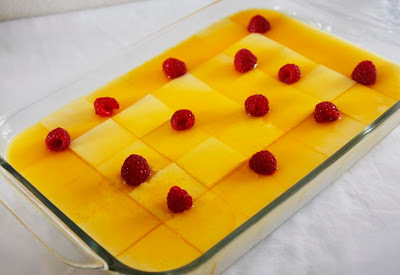 You can scatter some fruits on top. 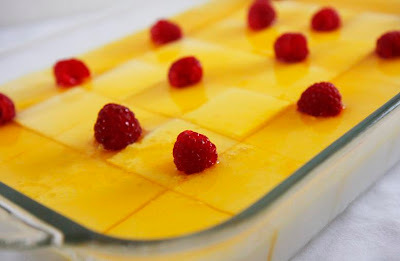 I used raspberry but mango or any fruits should work well. Serve cold. 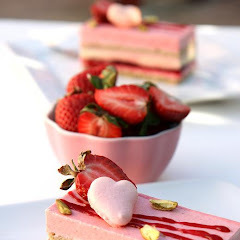 its looks sooo beautiful...i would love to taste it !!! It's so pretty! I love the clean lines and the great colors in your pictures. Reminds me of the Chinese almond pudding, which I absolutely love and used to make as a kid. Makes me want to go out a buy a box of agar-agar to revel in those childhood tastes once again. B $amp; D: thanks! it's so easy to make too!